When Mohammad Rahman first proposed creating a Data Dive competition on Purdue’s campus, he saw it as an opportunity to bring students from different academic disciplines together to tackle real-world data analysis problems. Partnering with the annual Dawn or Doom conference this fall made that goal easier to accomplish. That added exposure and collaboration – which for the Data Dive resulted in 171 students from six different schools or colleges registering for the event – has become one of the defining attributes of Dawn or Doom. That event has grown from a conference focused on the future of technology to a campus-wide discussion about technology’s role in nearly every facet of our lives. In the Data Dive, students used supply chain data provided by Cisco Systems, whose leaders helped judge the results and will make use of them in the company’s operations. “The fact that our students got to make their final presentation in front of executives from Cisco was invaluable,” Rahman says. Rahman also spoke at this year’s Dawn or Doom conference about the quandary between data and privacy, particularly as it relates to the Internet of Things (IoT) and the proliferation of “smart” products such as automobiles. “We are not far from the days when our intelligent cars will become an essential component of the personal assistance ecosystem,” Rahman says. “The data collected by our cars — such as the origin and the destination of a trip, the types of entertainments consumed and the amount of traffic faced — would be a treasure trove to get insights into a passenger’s mood. The tradeoff for such convenience? One possibility is that your autonomous car takes you only to the highest bidder’s restaurant to eat when you tell it to stop because you’re hungry, Rahman says. You could override the car’s advertising system, but it might cost you. Although most consumers have indicated that they prefer convenience over privacy, companies may be less comfortable with having their data publicized on the IoT. 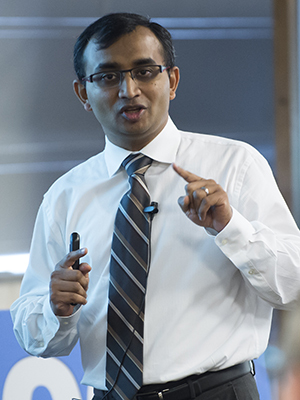 Toward that end, Rahman and his colleagues in computer science and engineering are creating algorithms that utilize cryptography and the cloud to hide data such as price points.